From the 27th to the 30th of September, Siena hosted the SIAF, the Italian most important conference on audiology and phonetics, a perfect showcase to present the 3D Tune In project and its applications. SIAF is a congress aimed at physicians and, specifically, audiology experts. During this year the congress (XXXVI Congresso Nazionale della Società Italiana di Audiologia e Foniatria - SIAF), had approximately one thousand registered participants; the vast majority of them were specialists in otolaryngology and audiology, as well as phoneticians, speech therapists and hearing aid technicians. GN booked a large stand for presenting the 3D Tune-In project. Visitors found resources and materials, and had the opportunity to test our apps and games. 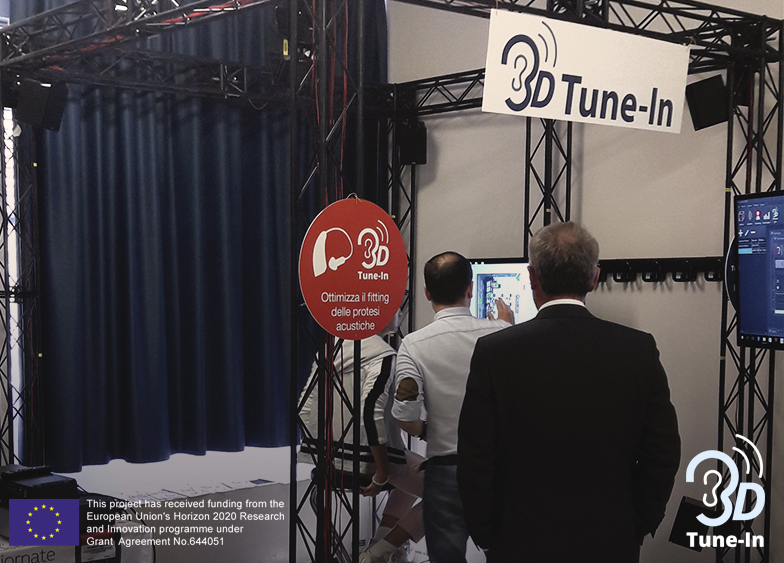 GN, Xteam and Vianet had the chance to explain the added value of the five 3D Tune-In apps, receiving useful insights and feedback from audiologists and other experts. More than 120 people attended our demonstration. We therefore had the opportunity to share our ideas and results with such a wide audience covering our potential users, researchers in the area and experts. We had the chance to exhange impressions with our market niche and to understand their current needs and requirements for adapting our applications during the final development cycle in the last months of the project. In particular, our exhibition focused on the AudGam Pro system. The idea of implementing a family of apps, named HearingGames Studio, was highly appreciated by the experts. Audiologists liked the possibility to use AudGam Pro during their clinics and invited their youngest patients to play at home with Dartanan and, for adults and elderly individuals, Play&Tune. Doing this, they are aiming to have a significant amount of data about their patients hearing profile, and to be able to analyse how people use the hearing aids for shaping a well-balanced hearing programme. The interest generated by the project was stunning. The feedback received was very positive and optimistic. People also asked for additional details, suggesting additional features and means for improvement. Phoneticians and speech therapists considered the 3D Tune-In games as a very useful and motivating tool for their patients in rehabilitation settings. Nowadays, serious games applied to learning and training environments are being accepted by experts and considered as a genuine added-value for their clinical practice. Following up on this, 3D Tune-In will also be presented at the National Congress of Paediatric Otolaryngology to be held in Rome from the 25th to the 28th of October. See you all there! Goodbye 3D Tune-In! Hello new Projects!! Copyright © 2015 3D Tune-In.eu. All Rights Reserved.